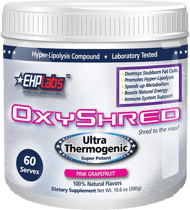 EHPLab’s Oxyshred is scientfically designed to trigger “Hyper-Lypolisis”, an even faster fat burning process. This potent blend of fat burners will help you achieve your weight loss goals. With 16 core ingredients, Oxyshred is divided into 3 main complexes–Hyper Lypolisis Compound, Immunity Booster, and Mood Enhancer. Each work in conjuction to keep you energized, revitalized, and elevated*. Composed of thermogenic powerhouses such as Green Coffee Bean Extract, Acetyl-L Carnitine, and Grapefruit Seed Extract, Oxyshred delivers a swift metabolic boost. However even more impressive, Oxyshred is the world’s first fat burning supplement to include immunity enhancers . L-Glutamine, Vitamin C, Taurine, and Tyrosine are incorporated to fight oxidative stress, to keep you strong and healthy while losing weight. Touted as one of the market’s best Fat Burners to date, Oxyshred is exactly what you’re looking for in a high quality weight loss supplement. Still unsure if Oxyshred lives up to the hype? There is only one way to find out.